Problem: Integrating all the critical metrics needed by each service line manager and decision maker is a time-consuming, cumbersome and expensive process. All the data you need is in your systems, but the questions keep changing and so your reports are being delivered 3 to 6 weeks later than you need them. By that time, the questions have changed again and the opportunity to effect change based on the information you actually possess has long passed. In short, data is not at your fingertips. It is phone calls, long walks and elevator rides and emails away and normally comes 2 weeks after you needed it at the earliest. Why is this acceptable? Maybe you have a BI toolset but you are far from being able to deliver dashboards to the enterprise. Solution: Aculyst’s Pre-Built Data Model is a turn- key solution which captures the core attributes managers need to run a hospital. Aculyst’s development team incorporated a set of critical dashboards by leveraging a decade of experience in a BI leadership role in a large NY hospital system. 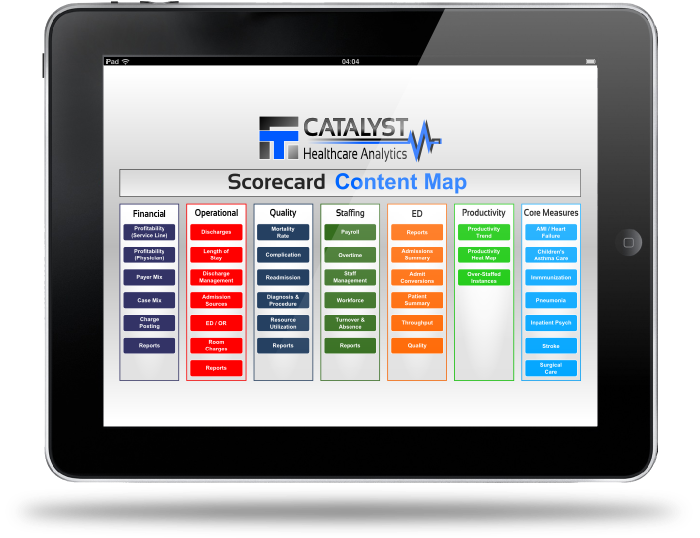 These core dashboards represent the fundamental metrics necessary to effectively manage a complex healthcare organization and are based on best practices. Not only does Aculyst drive results with pre-loaded dashboards for finance, operations, quality, staffing and the ED, but also offers customizations to the data model, making Catalyst the one ‘go- to’ system for all the reporting needs in your organization by any end user. Result: Your hospital will realize the benefit of Aculyst in weeks, not months and years because Aculyst has the core metrics and dashboards already built and waiting for your data. The model is source agnostic. The dashboards Aculyst delivers are ready to go and relevant to your reporting needs. Aculyst has done the heavy lifting for you. All that is required from your organization is to connect your data systems and start using Aculyst to realize the speed to value that Aculyst was designed to deliver. Stop using spreadsheets and system generated reports; start to use business intelligence dashboards by Aculyst..